Sony’s next flagship will obviously be Xperia Z5 and its compact version be Z5 compact and it is a known fact. A month back Sony officially launched Xperia Z3+ aka Xperia Z4 into the market but it seems that users wants to something new from Sony. During the flagship release Sony officials had spoken regarding – why the flagship is named as Z3+ for international users and why it is named as Z4 for Japanese consumers. On the same press event the officials had confirmed that the next flagship will be the Z5. Just few days back in Twitter , Sony Italy has confirmed that they will be launching new gadgets in IFA 2015. Their official event will be on September 20th. Recently we’ve seen a teaser made for Bond film showing a flagship with name Xperia (blurred) 5. We dubbed it to be the Xperia Z5 and that was the first news we knew about the flagship. Reportedly there’s an image leaked online showing fingerprint scanner on the Z5 & Z5 compact but it doesn’t show the placement of finger scanner clearly. The phone on the right side to the iPhone 5S is Xperia Z5 while the left side one is the Z5 Compact. 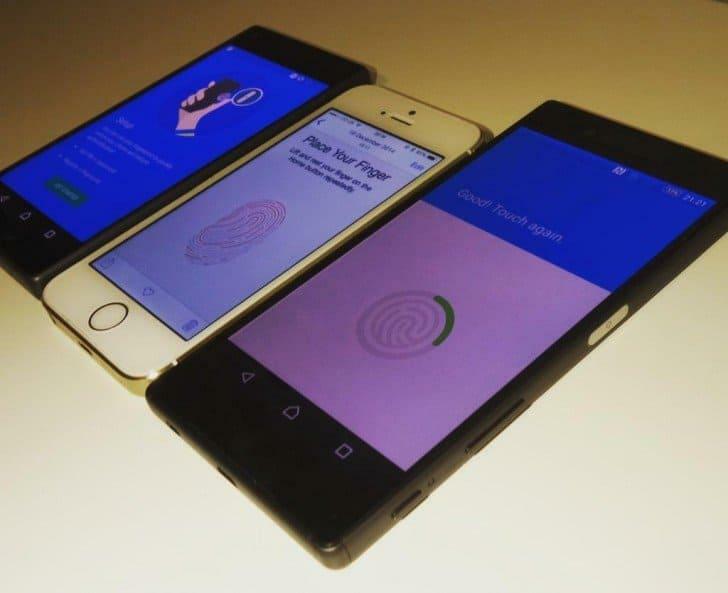 The leak only depicts the fingerprint authentication on the screen but doesn’t share any other information. Don’t you worry @Sony Fans. We found another leak on Z5 & Z5 compact. Thanks to @ViziLeaks who posted an image today claiming to be the next-gen Xperia “Z” devices. It is known fact that when ever there’s a new flagship coming up we will see the leaks before its release and Sony is particularly not an exception. Xperia Z3, Z4 and the previous flagships were also leaked online before the official release. On the other side, there’s a new leaked image. You can see two smartphones one on another showing the side view of the phone. You can find the power button which is embedded with the fingerprint scanner. Beside to it there’s a volume rocker and a dedicated camera button. The volume keys comes in handy and are compact to reach for the Z5 but in Z5 compact it is quite hard to use them with one hand. These leaked images may or may not be the official pictures, but most of the leaks were confirmed to be true previously. Hopefully we might see few more rumors on this flagship before it gets its release officially.